Q – I do not have a Thermomix, will I still be able to make the recipes? A – Yes, most recipes will have alternative non-Thermomix steps which utilise standard kitchen appliances. 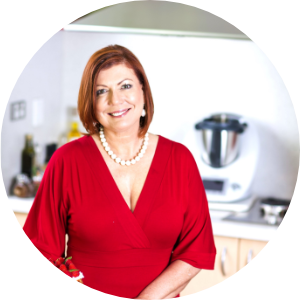 We are currently in the process of adding each recipe without the use of a Thermomix so keep an eye out for new non-Thermomix recipes each week. Q – What is EVOO? Q – What type of oven is best? A – All ovens have a range of different features, and temperatures can vary oven to oven. Fan forced is the standard setting used when recipes are tested, therefore use the fan forced setting for each recipe unless otherwise stated. Q – I need help making sourdough, what is your best advice? A – The best advice for sourdough would be to use The Cheats Sourdough recipe, which requires you to make a normal batch of dough, retain 200g of dough (unbaked) and then let it go sour before adding it to the next batch of dough that you make. Continue this process and over time, ‘the starter’ will become more and more sour. Q – What is umami paste? Umami Paste can bring about many questions, if you have any other questions do not hesitate to contact us. Q - Where can I get Callebaut chocolate from? A – Callebaut chocolate can be purchased through Tenina’s online store. Tenina is passionate about quality ingredients and has travelled to Ghana to see Callebaut chocolate’s bean to bar process. The quality and ethical nature of the chocolate, we believe makes it the best on the market. Note: We only ship chocolate during the cooler months to avoid it melting in transit. Q - I have purchased an eBook, how do I add it to my iPad or iPhone? Q – When are items shipped from the store? A – Orders received by 10am WST on business days will be sent the following day. Unfortunately, we do not offer express post, however all items will be sent as soon as possible and should arrive within a few business days. Q – What type of brands, do you typically work with? A – We work and have worked with a range of brands from food and ingredient items to kitchen appliances and cooking events. For more information head to the Work with Me page. Q – I want to know more about the Cooking With Tenina brand, how can I get more information?